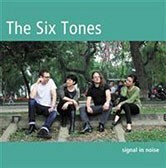 This double CD was recorded at a point when The Six Tones had begun opening up towards the many subcultures of experimental and electronic music on the scene in Hanoi. Initially,the group was focussed specifically on the encounter between the traditional Vietnamese music that Ngô Trà My (who plays đàn bầu) and Nguyễn Thanh Thủy (who plays đàn tranh) represented and the Western experimental and composed musics that Henrik Frisk and Stefan Östersjö were associated with. From this point of departure, the group became more and more a venue for destabilizing our identities as performers. This instability has urged a different kind of listening, a tuning in to the noise of an unknown music. The essence of our aims with the group is to create music that builds on the tension between our distinct traditions but in order to achieve a more in depth understanding of these interrelations, many years of mutual learning have been called for. Since 2006, The Six Tones have been bringing art music from Vietnam and Europe together, touring as an instrumental music group or in music theatre projects, and working with choreographers. We play traditional Vietnamese music in hybrid settings for Western stringed instruments and traditional Vietnamese instruments. We improvise in traditional and experimental Western idioms and also commission new music by composers in Asia as well as in Western countries.The Six Tones are Nguyễn Thanh Thủy and Ngô Trà My and the Swedish guitarist Stefan Östersjö (also playing many other stringed instruments). Since the project started, we have been collaborating with the composer and improviser Henrik Frisk, who has both composed works for the ensemble as well as toured with the group as a lap top improviser. The name of the group, emanating from a composition by Henrik, relates to the fact that the Vietnamese language is a tonal language using six tones or intonations. Our main ambition has been to create a foundation for a meeting between two distinct musical cultures on equal terms. This practice implies the questioning of what is ”centre” and what is ”periphery”: is the Western art music the norm (centre) and the traditional Vietnamese music an exotic ”other”? Still a long time after the world had been found to rotate around the sun, the world, in the mind of a Westerner, continued to be centred round Europe. In music, we find a parallel in the conception of differences of a hierarchic nature between notated and orally transmitted music. What can our distinct musical cultures learn from each other? How can the Western art music adopt a listening role? How can our ears be tuned to hearing signal in the noise? The Vietnamese modal scales, or điệu, can be divided into two main systems, the bắc system and the nam system, which can be translated as ‘North’ and ‘South’ respectively. These terms do not simply represent music from these geographical regions, but rather they refer to emotional types not unlike those of the Western cultural construct of major and minor scales, hence nam modes are ‘sad’ and bắc modes are ‘happy’. However, the way these types are distinguished is equally dependent on the articulation and vibrato types stipulated by the mode and not always by different pitch shapes. For instance the Ai and Xuân modes have identical pitch structures but by the way the ornamentation is shaped, the modes afford clearly distinct musical materials. The opening and closing tracks are different versions of Nam Ai,a central piece in the Tai Tú traditions in the south. It expresses the longing and melancholy that is characteristic of much Vietnamese music. This specific expression is embedded in the sliding articulation and the microtonal intonation that for a Western ear may sound like a meeting between the blues and French baroque music. On the CD there are two versions of Nam Ai, one with trio and electronics and, in the closing track, an electronic remix of the same performance. The second track on the first CD is a famous piece from the northern Cheo theatre. Hề Mồi is music that is associated with a clown-like figure, but the jocular mood introduced by this tune is very soon interrupted by cut up phrases, suggesting a more violent narrative. Just after the recording was made in Hanoi, we went to Seattle to start up a music theatre project involving the American composer Richard Karpen. In the development of IDIOMS, a piece of music theatre with actors from three continents, Hề Mồi became one of the core materials and in the composition we explored yet new ways in which the traditional music could be decomposed. Another mode of central importance is Oán, which is very closely connected to Ai but its characteristic expression is even more profound. In Oán, the same scale becomes the point of departure for the most elaborate ornamentation that you find in Vietnamese traditional music. One of the first traditional tunes that we tried to bring into dialogue with experimental modes of expression is called Tứ ĐạiOán (perhaps the most extensive expression of the features of theOán mode). We played it the first times in concerts in Sweden in 2007. In the first versions we decided on a simple formal structure, dividing the piece in the middle with a free improvisation in between sections of the piece played in traditional style. At this time, we were well aware of the experimental nature of this approach. In later versions we have attempted at a more complex layering and structuring of the different materials. Tứ ĐạiOán is a piece that belongs to a firmly established tradition, in which the ornamentation and the sequence of melodic patterns are quite clearly defined. Hence, the identity of this music is in many ways as fixed as that of any composition in Western art music. How can hybrid identities be negotiated in a cross-cultural collaboration like ours? How can we identify musical meaning in music that redefines the fundamental building blocks of a certain musical tradition? The rehearsals before the recording session with Lê Phổ, a leading proponent of traditional flute music in Vietnam, were memorable. Not only were we taken aback when we heard a musician with such a strong foundation in traditional music – he is currently the head of the department for traditional music at the Vietnam national Academy of Music -take off in free flight like a Vietnamese Charles Lloyd. Also, our encounter with Lê Phổ became an expression of how music can speak beyond language. We had decided to work on a traditional piece titled Dạ Cổ Hoài Lang. (This piece is also recorded on the CD as a duo with dan tranh and guitar.) The lyrics describe the love of a woman for her husband who had been away for a long time at the front. Hence, yet another piece of Vietnamese music that expresses longing and melancholy. Thuy and My were on tour in Thailand so Henrik and I had no one to help us with translation. We had never met before the first rehearsal, just a few days before the recordings were made. Henrik was playing electronics based on loops that we had recorded. In fact, I think the way we structured the electronics was a more Western take on melancholy: the sonority of the loops – based on guitar samples that we made in the hotel room – and the way they created a soundscape that somehow enhanced the expression of the flute and guitar music are not so distant to the melancholy of a Daniel Lanois production. Anyway, we were of course anxious to know how Lê Phổ felt about working with electronics like this. (Henrik was also processing the sound of the flute.) To our surprise, he didn’t say anything about the electronics, he just looked like beyond himself (but maybe he was rather looking inside himself) and said it was fine, he thought of his mother and her house and then he just played. It is only now when we talk about the expressive content of this song that I realize what he actually was saying. When he speaks of his mother, he is talking about the same longing for the past as is the fundamental resonance of this music. The titles of the two tracks recorded with Lê Phổ – Dạ một and Dạ hai- refer primarily to the first line in the text of the original song, Dạ Cổ Hoài Lang. The ancient meaning ofDạ is ”night”. In modern Vietnamese it may refer to heart, mind, memory and to many other inner qualities. Beyond the fact that we did not share a verbal language to communicate with, the making of these recordings expressed so much of the ” Dạ” that we all carry inside. The making of this album confirmed an already ongoing widening of the space for the work of the group. Three more guest performers in the recording sessions point towards the many currents of experimental music on the lively scene in Hanoi. Of course, for us, the presence of Trí Minh, Vũ Nhật Tân and Trần Thị Kim Ngọc was different to the encounter with Lê Phổ. These three leading musicians within experimental Vietnamese music were close friends of ours since many years. Since the beginning of the 1990s, after graduating from the Hanoi Conservatory of Music, Trí Minh, together with some other young musicians started to play jazz in various locations in Hanoi. After a period of working as a jazz improviser, Trí Minh started to explore electronic music as a DJ and in more experimental contexts. He has performed together with many international artists and DJs like Robert Henke (DE), Robin Scanner (UK), Dickson Dee (HK) and The Six Tones and toured in many countries in Europe, the US, Hong Kong, China, the Philippines, Thailand, Malaysia and Singapore. He is the artistic director of the Hanoi Sound Stuff Festival. After studies at the Hanoi National Academy of Music Vũ Nhật Tân studied computer music in Cologne on a scholarship from the Deutscher Akademischer Austauschdienst (DAAD). In addition, he studied composition with Chinary Ung at the University of California at San Diego in 2002 as a guest student in the framework of the artists in residency program of the Asian Cultural Council (ACC). His music has been performed at festivals in Asia, Europe and the US. In 2002 Vũ Nhật Tân turned towards live performance with laptop and electronic devices. He currently teaches in the new department for electronic music at the Vietnam National Academy of Music in Hanoi and is founding member of the experimental music group DC-Factory. The tracks on the CD featuring Vũ Nhật Tân and Trí Minh were recorded as quartet performances live in the studio with Henrik and Stefan. The đàn tranh and đàn bầu parts were added later, but it became obvious when Thuy and My made the additional takes that we must have implied their presence in everything we recorded. In a similar, but opposite, way the traditional tune Lới Lơwas recorded by Tra My alone and, since time did not allow more work on it, we added electric guitar and saxophone in a studio at the Malmö Academy of Music later in 2010. Two of the tracks recorded with Vũ Nhật Tân and Trí Minh are calledOán, with reference not to the actual mode but to the severe expression it is associated with. One track was titled Tre (bamboo), with reference to the colours of the bamboo flute that Tân played. The collaboration between The Six Tones and the Vietnamese composer and vocal artist Trần Thị Kim Ngọc started in autumn 2009 during Hanoi New Music Meeting. This event, curated by Kim Ngọc, brought performers from several countries in Europe together with performers of traditional and experimental music in Vietnam for a series of workshops that resulted in two touring productions of improvised music and composed works. Trần Thị Kim Ngọc was born in Hanoi. When she was 14, she wrote her first compositions under the instruction of her father, the composer Tran Ngoc Xuong. After getting her university degree at the Hanoi Conservatory of Music she studied composition with Professor Johannes Fritsch, improvisation with Paulo Alvares in Cologne and attended two summer courses with Karlheinz Stockhausen. Her works for ensemble and orchestra have been performed by orchestras such as Ensemble Modern, Ensemble d’Autorium Oliver Messiaen, Baseler-Symfonieorchester and broadcast by Deutschland Radio Berlin, Westdeuschland Radio (WDR), Deutschlandfunk, Radio France, a.o.. Kim Ngoc is also a profiled composer for music theatre. She lives in Hanoi working as freelance composer and director of DOM DOM, a center for contemporary music in Hanoi. The recordings with Kim Ngọc brought out a variety of different modes of expression through improvisations with both voice and fierce explorations of the sonorities of the dan tranh. Five tracks on the album draw on the Wu Xing or the five elements of Chinese philosophy, in Vietnamese they are Mộc (Wood), Hỏa (Fire), Thổ (Earth), Kim (Metal) and Thủy (Water). Central to the Wu Xing is the series of cycles that create a specific balance, through the elements and the many layers of meaning that they represent, through an endless process of destruction and recreation. This balance between elements we find also in the way we draw different musical traditions into similar cycles of destruction and regeneration. Taken together, the explorations of the field of tension between traditional and experimental music in Vietnam and in the West that this CD reflects for us constitutes an attempt to, speaking with film-maker and feminist researcher Trinh Minh-ha, tuning different ways of listening to one another. “Tuning inwardly, tuning outwardly. [...] In the process of tuning, a subject becomes a poem effortlessly; what is brought about in time is not the search for a given pitch – the standard A or the preconceived chord which constitutes the universalized measure of perfection in Western musical traditions. On the contrary, what progressively materializes is an ‘artless balance’ through which takes shape, each time differently, the evolving pitch to be shared among performers, listeners and instruments played.” (Minh-ha 2011, p. 91) Through this ongoing “rehearsal” one can observe the growing recognition of signal in the noise of our different musics. Recorded in Kiên Quyết Studio, Hanoi and at the Malmö Academy of Music, Sweden. Mixed by Henrik Frisk and Stefan Östersjö at Malmö Academy of Music. Mastering by Kent Olofsson and Henrik Frisk at Inter Arts Center, Malmö. Special thanks to the guest performers from Hanoi: Lê Phổ, Trí Minh, Vũ Nhật Tân and Trần Thị Kim Ngọc. Without you, this would have been an entirely different album! Hi, where is it possible to buy the CD? In Hanoi or online. “Signal in Noise” is distributed world wide by Naxos and you can buy the CD from naxosdirect.se, or CDON.com, or order it in a record store.